The Vully wine region may be small but it has everything a larger one has to offer thanks to its young dynamic vine growers. A land of contrasts, nestled between two lakes, this beautiful region benefits from a very favourable climate. From Lake Neuchâtel to Lake Morat, from the Vaud to the Fribourg region, from French- to German-speaking Switzerland, from the Roman town of Avenches to the lakeside town of Morat, from traditional wine houses to young dynamic producers, the Vully wine region is a passageway between two worlds. The 150 hectares, of which 50 hectares are in the Canton of Vaud and 100 hectares in the Canton of Fribourg, make up Switzerland’s only intercantonal AOC. 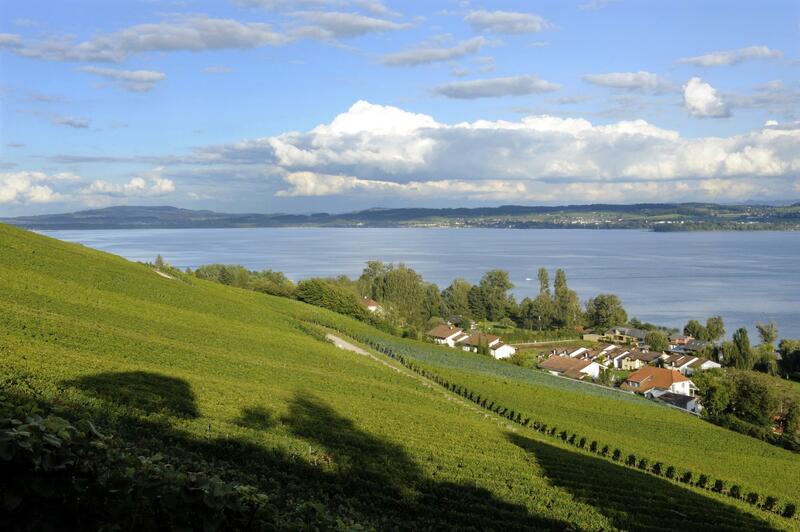 The Vully AOC vineyards are distinctive by their dynamism and the grandeur of their wines. Well-known with connoisseurs, the chasselas releases its aromas of the land. The Pinot noir draws its elegant notes from the terraces built on molasse. Not forgetting the delights of specialities like Gewürztraminer or Charmont. Passionate vine growers love to share all these wines during tastings to be enjoyed on gourmet holidays. Cultural trips to Avenches and other enjoyable events are the perfect complement to the region’s wine tourism attractions. This is the second tourist region of the Canton of Vaud that proposes an interactive and fun oenotouristic walk with the Vaud Guide Application. Vully is proud to welcome you in its vineyard and to present its specialties.